The julienne cut in cooking is to make long thin strips or sticks out of food. Basically a French Fry shape. Generally, making that cut is not too hard, as you can usually cut planks, or slices, and then further cut those planks into match stick shapes. However, in the case of red onions, things get a bit trickier. Red onions, in addition to being round, and thus less amenable to planks, they are layered as opposed to solid. So what’s a cook to do? It’s actually not too bad, and with a bit of repositioning of the knife you can julienne a red onion without too much stress. I show you how in the video, and with the steps below. As you work through the red onion, eventually you’ll get small piece of uncut onion that is taller than it is wide. Flip that piece on it’s side and repeat the process. 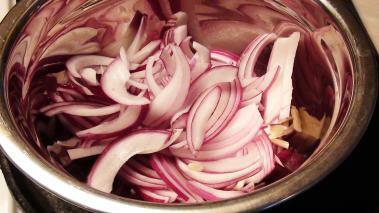 Do the other half, and you’ll have long slightly curved strips of red onion and the perfect julienne cut.